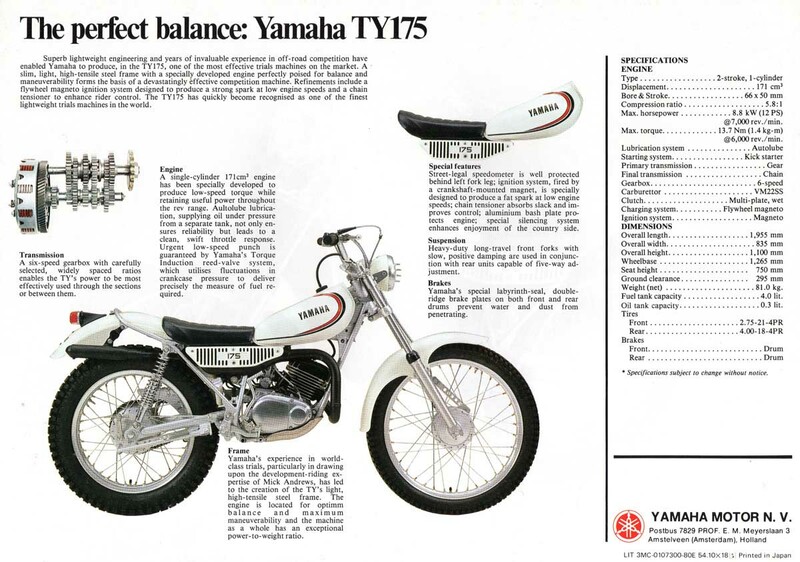 Here's a scan of a period TY175 2 page brochure. Superb lightweight engineering and years of invaluable experience in off-road competition have enabled Yamaha to produce, in the TY175, one of the most effective trials machines on the market. A ·slim, light, high-tensile steel frame with a specially developed engine perfectly poised for balance and manoeuvrability forms the basis of a devastatingly effective competition machine. Refinements include a flywheel magneto ignition system designed to produce a strong spark at low engine speeds and a chain tensioner to enhance rider control. The TYl75 has quickly become recognised as one of the finest lightweight trials machines in the world. A six-speed gearbox with carefully selected, widely spaced ratios enables the TY’s power to be most effectively used through the sections or between them. A single-cylinder 171cm3 engine has been specially developed to produce low-speed torque while retaining useful power throughout the rev range. Aultolube lubrication, supplying oil under pressure from a separate tank, not only ensures reliability but leads to a clean, swift throttle response. Urgent low-speed punch is guaranteed by Yamaha’s Torque Induction reed-valve system, which utilises fluctuations in crankcase pressure to deliver precisely the measure of fuel required. 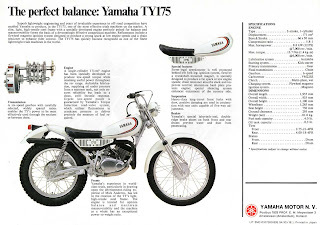 Yamaha’s experience in world-class trials, particularly in drawing upon the development riding expertise of Mick Andrews, has led to the creation of the TY’s light, high-tensile steel frame. The engine is located for optimum balance and maximum manoeuvrability and the machine J as a whole has an exceptional power-to-weight ratio. 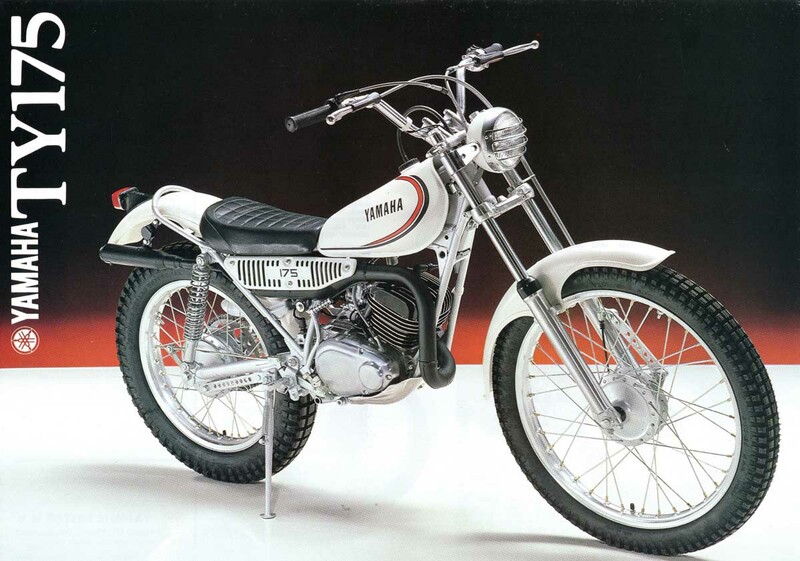 Street-legal speedometer is well protected behind left fork leg; ignition system, fired by a crankshaft mounted magnet, is specially designed to produce a fat spark at low engine speeds; chain tensioner absorbs slack and improves control; aluminium bash plate protects engine; special silencing system enhances enjoyment of the country side. Heavy duty long-travel front forks with slow, positive damping are used in conjunction with rear units capable of five-way adjustment. Yamaha’s special labyrinth seal, double- ridge brake plates on both front and rear drums prevent water and dust from penetrating. Max. horsepower 8.8 kW (12 PS) @7,000 rev./min. Max. torque 13.7 Nm (1.4 kg—m) @6,000 rev./min. Fuel tank capacity 4.0 lit.